Church Out Serving (COS): a growing network of Christian believers in Norfolk County that come together to host and participate in events and projects, to serve neighbours and friends in our community by sharing Jesus' love through acts of care and kindness. Norfolk Pregnancy Centre: located on Robinson Street in Simcoe. Trained peer counsellors are there to listen to your concerns and questions about pregnancy, abortion, STDs, and related issues. All of their services are free and confidential. 519-428-2177. Alliance for Life Ontario: the provincial co-ordinating organization for educational groups across Ontario. Alliance for Life presents a united voice to bring about greater respect for the dignity and worth of all human beings from conception/fertilization to natural death. We Want The Debate Campaign: a project of Alliance for Life Ontario. It represents Ontarians of all backgrounds who believe that it is time to fight for democracy and demand an end to suppression of certain views and censorship of others. In this case, an open, honest and transparent debate on abortion is wanted. 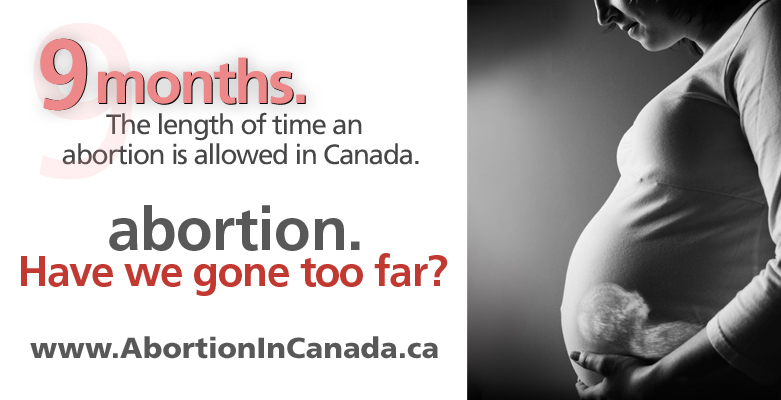 Abortion in Canada: Abortion. Have we gone too far? Adoption in Canada: The complete resource for women with unplanned pregnancies who might consider placing their babies for adoption in Canada. It attempts to lead the woman who has discovered her untimely pregnancy through the common misconceptions about adoption, give her the knowledge and tools she needs to make an informed decision, and to regain control over both her and her child's future. Campaign Life Coalition: the premiere advocate for legal and cultural change in Canada with respect to protecting human life and the family; a national, non-profit organization with offices from coast-to-coast; and works tirelessly to heal the cultural insanity that leads our nation to tolerate the killing of 100,000 pre-born Canadian children every year. Euthanasia Prevention Coalition: exists to build a well-informed broadly-based network of groups and individuals to create an effective social barrier to euthanasia and assisted suicide. The goal is to help build a stronger unified coalition of those who oppose euthanasia and assisted suicide. It is important to note that the Euthanasia Prevention Coalition has distributed several thousand copies of the "Life-Protecting Power of Attorney for Personal Care". This is a document that is designed to protect you from being dehydrated to death or denied basic care. Information on how to obtain a copy here. Focus on the Family Canada: A charitable organization which has been serving families in Canada since opening its doors in 1983. For over 25 years, it has provided care, advice, support and encouragement to families at every stage of life. On Life, this organization believes that human life is of inestimable worth and significance in all its dimensions, including the unborn, the aged, the widowed, the mentally handicapped, the unattractive, the physically challenged and every other condition in which humanness is expressed from conception to the grave. I am a Human Being: from zygote to embryo to fetus to newborn to adolescent and throughout adulthood until natural death. A project of Campaign Life Coalition. Priests for Life Canada: an association of Canadian Catholic priests and lay people who give special emphasis to promoting and defending the sanctity of human life. 40 Days for Life: a community-based campaign that draws attention to the evil of abortion through the use of a three-point program: Prayer and fasting, Constant vigil, and Community outreach. American Life League (ALL): the largest grassroots Catholic pro-life education organization in the United States. ALL is committed to the protection of all innocent human beings from the moment of creation to natural death. Heartbeat International: works to inspire and equip Christian communities worldwide to rescue women and couples from the agony and violence of abortion through the development of neighborhood pregnancy help centres, maternity homes, and adoption services. Human Life Alliance (HLA): is a non-profit, non-denominational, pro-life organization dedicated to protecting human life from the moment of conception until natural death. HLA's priority project is to publish and distribute advertising supplements, focusing on abortion, euthanasia, and chastity, through mainstream media and college newspapers. International China Concern: a Christian development organisation bringing love, hope and opportunity to China’s abandoned and disabled. Founded in 1993 by David Gotts, International China Concern exists to help the disadvantaged live life to the full and to their God-given potential. Lutherans For Life: Equipping Lutherans to be Gospel-motivated voices For Life. Priests For Life Organization: Priests for Life is deeply committed to the unity of the pro-life movement and to active cooperation among groups of every size and denomination. Every group is important and of critical value to the effort to end abortion, and they are constantly inspired by the work of the many pro-life groups that exist. StandUpGirl.com: Need someone to talk to…someone you can be real with? We’re here for you.We have an amazing community of women here. Women who get what you’re going through, because they’ve lived through it. Women who care. LifeSiteNews: LifeSiteNews.com is a non-profit Internet service dedicated to issues of culture, life, and family. News reports are widely circulated reports on important developments in the United States, Canada and around the world. Their purpose is to provide balance and more accurate coverage on culture, life and family matters than is usually given by other media. LifeNews: LifeNews.com is an independent news agency devoted to reporting news that affects the pro-life community. Ready to Stand: Pro-Life Radio : Discusses all things pro-life. USA. *Please Note: Voice for Life does not necessarily endorse or promote any of the organizations, issues or ideas contained in linked sites. They are merely provided for your information and possible educational resource value.